Football is big business. Everybody knows that. Football is also show business – increasingly so as the Premier League clubs offer big money to lure big-time players from around the globe. But the loyalty of long-term fans was nurtured on crumbling terraces and in rickety stands that reared up from red-brick streets. Fans put up with discomfort, questionable safety standards, verbal and sometimes physical threats, watery Bovril and primitive toilets. Why? For the camaraderie forged by a common cause; the moments of magic that transform a humdrum Saturday afternoon or a chilly, floodlit evening; the unlikely victories against seemingly impregnable opponents; the chance to say “I was there”.Fields of Dreams is a book that goes in search of those moments, those memories from Maine Road and Highbury, the Baseball Ground and the Goldstone Ground, the Dell and the Den and many more. 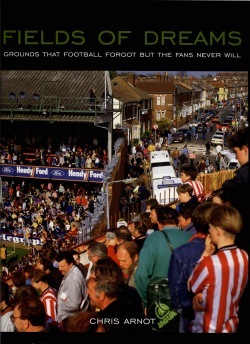 Chris Arnot travels from the south coast to Wearside, from Cardiff Bay to the Humber Estuary to tease out the tales of 25 grounds that football forgot but the fans never have and never will.